Hello, and welcome to my website. I hope you get the chance to come down and fish with me on the fabulous gin clear flats of the Florida Keys. 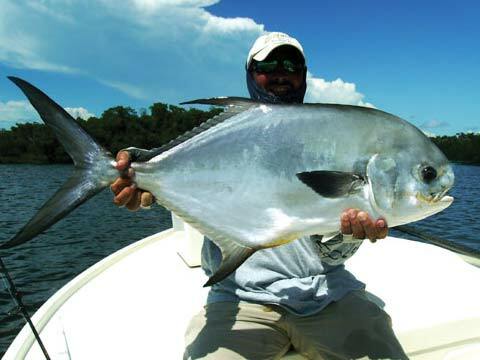 I fish between Marathon and Key West including Big Pine Key, Little Torch, Ramrod, Summerland, Cudjoe, Sugarloaf, the Marquesas, and the backcountry of Everglades National Park. I fish out of my house in Cudjoe Key, but quite often trailer my Maverick flats boat. The wind, water temperature and tides determine where we will fish on any given day. I am a hard working patient fishing guide that will do anything I can to make sure that your day out on the water is a success. I specialize in fly fishing and sight fishing with light tackle. For saltwater fly fishing, the double haul cast is frequently used. Depending on the time of year, I fish for tarpon, permit, bonefish, redfish, shark and barracuda. Please feel free to call me or e-mail me with any questions that you may have. Captain Bob has been fishing his whole life and is a very well rounded fisherman. His father was an avid fly fisherman who showed him the ropes at a very young age. He got his start with with the traditional Zebco 202 fishing for blue gill and large mouth bass. When his father thought the time was right, he taught Bob the fine art of fly fishing for trout and large mouth bass. It was not long before Bob bought his first boat and started fishing for rockfish on the Chesapeake Bay. He then moved to Ocean City, Maryland where he became a successful offshore mate earning his master captainâ€™s license fishing primarily for marlin, tuna and shark. While working in the Florida Keys on an offshore fishing boat, he discovered flats fishing and knew this was right up his alley. He then bought a house on Cudjoe Key where he immediately started doing his homework learning the flats and tides of the surrounding keys. After years of study, he decided the time was right and started up Double Haul Charters. He is a full-time guide. Capt. Bob will guide you on your search for bonefish, tarpon, permit, barracuda, shark and anything else you may encounter and make you feel as comfortable as if you were fishing with an old fishinâ€™ buddy. He is very patient with children and novice anglers as well as the experienced old pro and will fine-tune your fishing skills regardless if you chose fly or spinning tackle. If your fly-casting is rusty or if you are new to fly fishing, Bob is an experienced fly fishing caster and will gladly share his knowledge with you for as long as it takes. Bob has devoted his whole life to fishing and feels a great amount of pride each time you hook a fish and will use all of his experience to put you on fish. So for a great time on the water, come join Capt. Bob at one of the finest fishing destinations in the world, the Florida Keys. The Double Haul is a 17-foot custom 2006 Maverick HPX skiff powered by a dependable Yamaha outboard. It has a soft, dry ride and very stable casting platform. She has raised decks fore and aft and outfitted with up-to-date Coast Guard approved safety equipment and helpful fishing electronics such as a G.P.S. and tide predictor. Dry storage for all of your clothing and cameras is provided. A cooler will be provided for and food or drinks you may want to bring. What makes this boat really shine is itâ€™s extremely shallow draft and no slap hull. It can take you to extremely shallow areas not accessible by larger, deeper drafting boats. With its no slap hull it also does it with complete stealth. The closer you can get to the fish the shorter the cast for you. My other boat is a 17-foot custom Mitzi skiff. I use this boat when I need to get in super skinny water. People are always amazed on just how shallow we can go in this boat. It has a no slap hull so we do not spook the fish and you will enjoy how stable it is. It is also out fitted with all the latest electronics to help us find the fish.